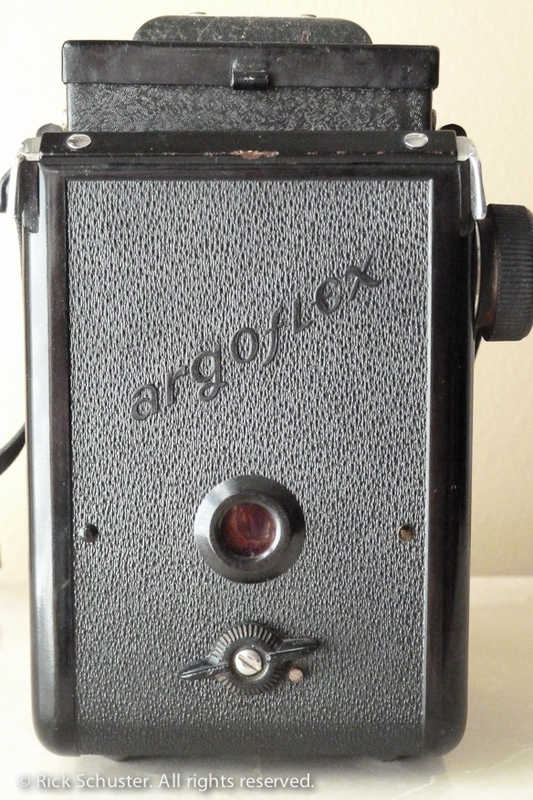 The art-deco bakelite-bodied Argus Argoflex E was made in Ann Arbor, Michigan from 1940 to 1948. 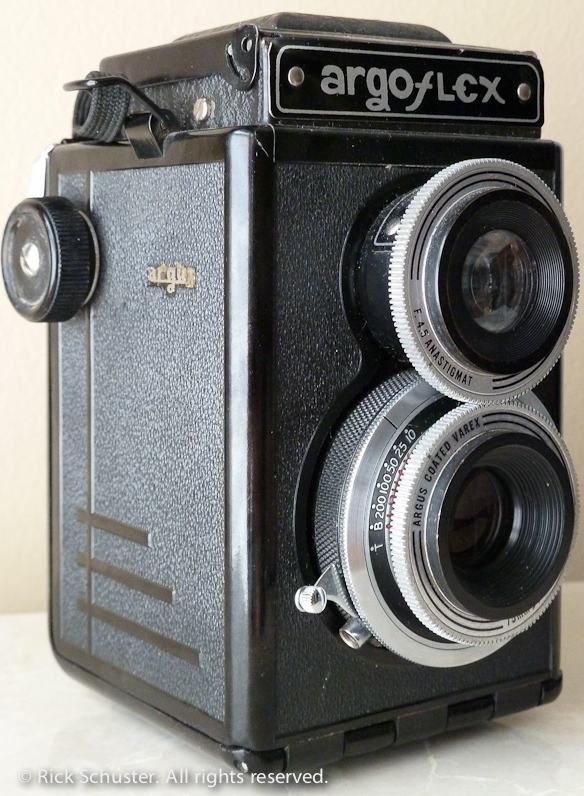 It’s a cute little twin-lens reflex camera, with a gear-focusing front element lens similar to the Ricohflex. But based on my first roll of film through the Argoflex, the lens isn’t as good as the Ricohflex. 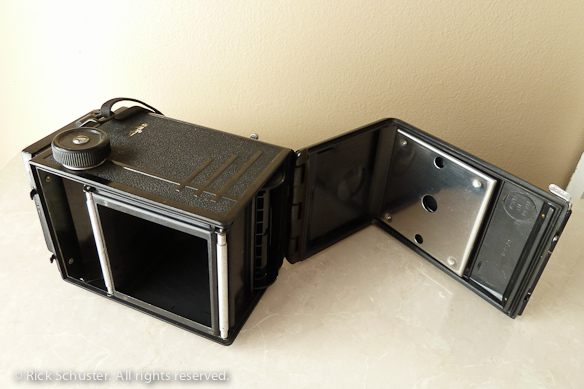 I’ll add some photos of the camera and more information about it soon. It’s a fun little camera – nice and light; real focusing (unlike the psuedo-TLRs like the Duoflex from Kodak), 1/10 – 1/200 sec shutter, plus B and T; f/4.5 to f/18 75mm lens. It’s made for 620 film, but a nice thing about it is that 120 spools will fit. 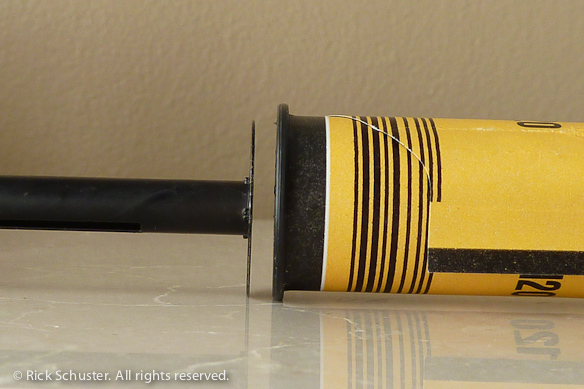 In the take-up spool position, the 120 spool is a bit tight in mine, so winding the film takes some force. But the supply spool area holds a 120 spool nice and loosely, so even though it seems like you’re forcing it to wind, the film shouldn’t be under any stress or extra tension. I ran my first roll through with a 120 roll of film in the supply side (bottom of camera) and an old 620 spool in the take-up position just to make sure things went smoothly. It’s easy to come by 620 spools if you find some old brownie cameras at rummage sales (they’ll usually have one spool left in the camera from the last roll of film shot), and you can just ask your processor to return the spools to you. I haven’t lost one yet. 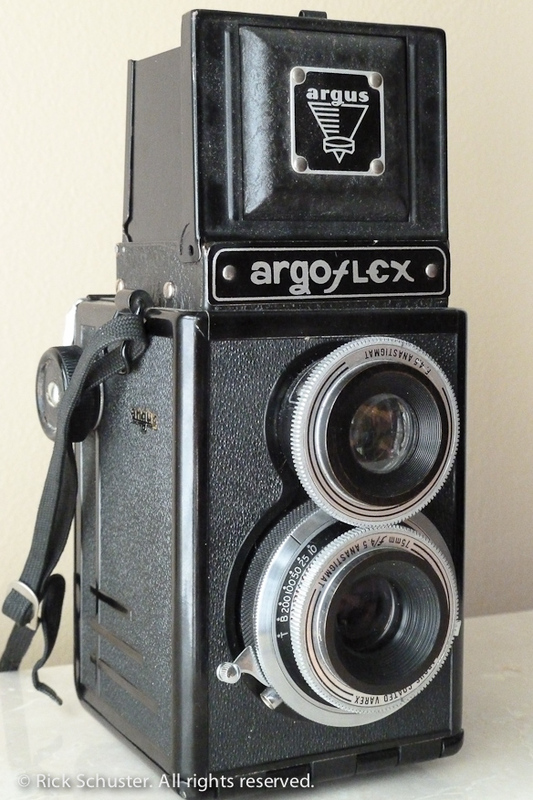 Shooting my first roll of film in the Argoflex, I found that the lens produces very low-contrast images. I had to boost the contrast significantly in Lightroom, but was able to get decent images out of it. They have a slight softness to them that’s kind of nice. 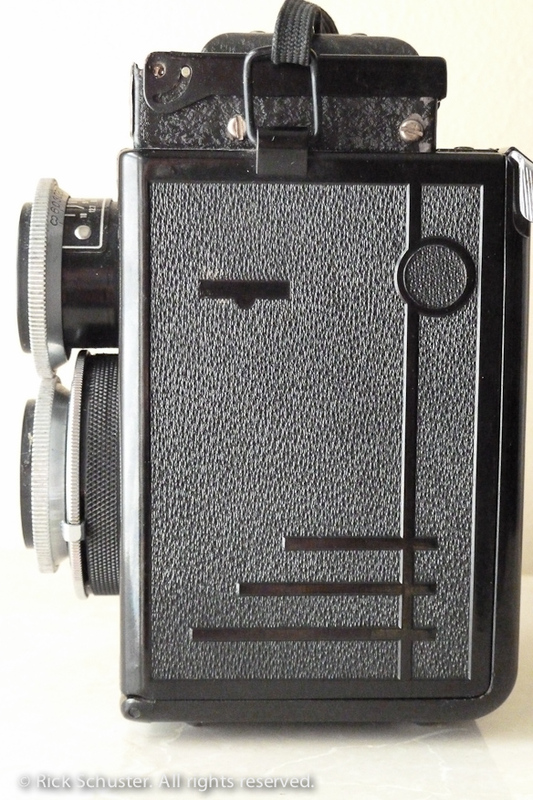 This particular camera is a post-WWII version, which you can tell because the earlier models had a small knob on the left side below the viewfinder, where on this model there’s simply a decorative circle. 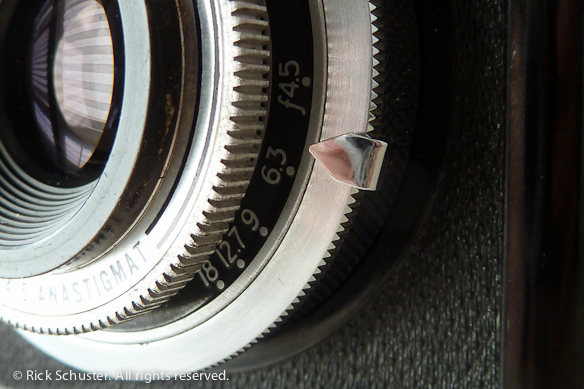 Shutter speed is set with the silver dial. 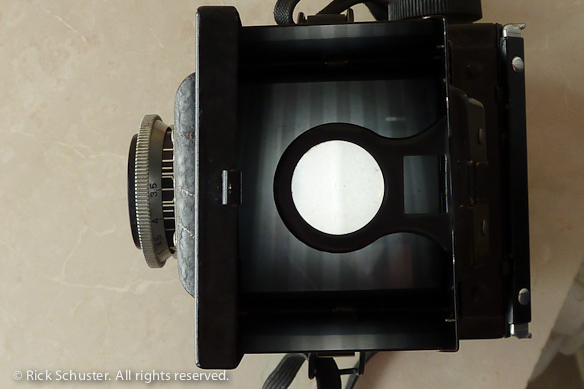 Speeds of 1/10 to 1/200 sec, plus B (bulb) and T (time). T opens the shutter on the first shutter click and keeps it open 'til you click it again. Shutter lever requires no cocking, just push down. 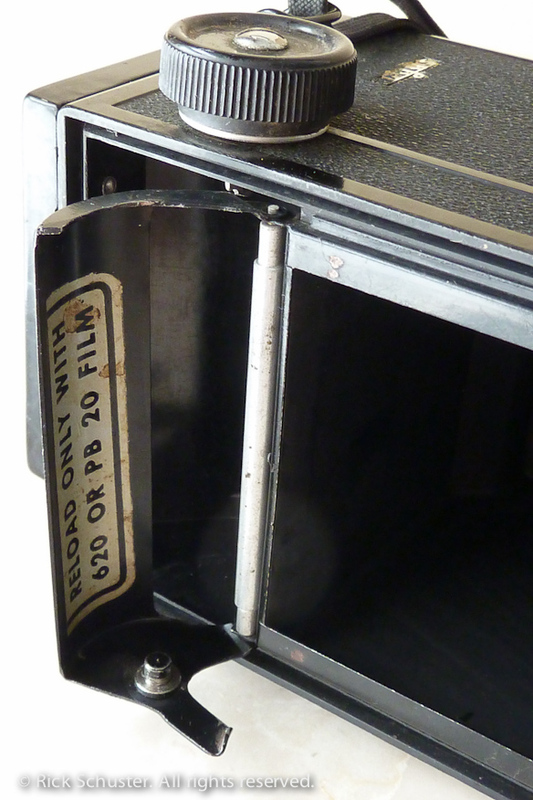 Even though the film-counter window has a red window, it also has a solid door to completely block out light, which swings open using the lever under it. The two silver tabs at the top of the door open the back. The swing-out holder where the take-up spool goes. I can fit a 120 spool in here, but it's a little snug. The supply spool area on the bottom has plenty of space for a 120 spool. 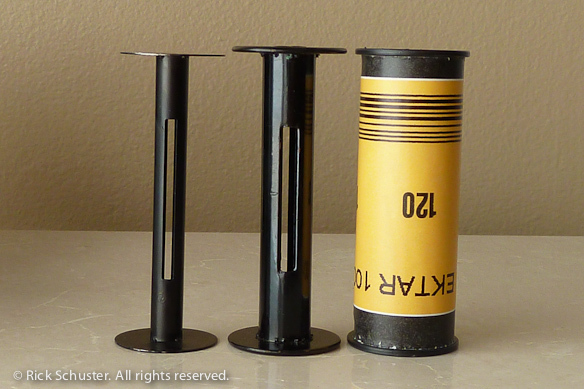 Size difference of film spools: left: 620 spool, center: old metal 120 spool, right: modern plastic 120 spool. I am new to this camera and I am trying to find a film to test it out. Do you think this kind of film is good? Thanks! Yes, Ektar is fine film. 100 speed film is good, since the shutter speeds aren’t fast on this camera. Portra 160 would be a good choice for color film, too. I test out 2 rolls of film already, one color and one B&W. I found the view finder is extremely hard to use. I barely see anything through it. Especially in the dim light. 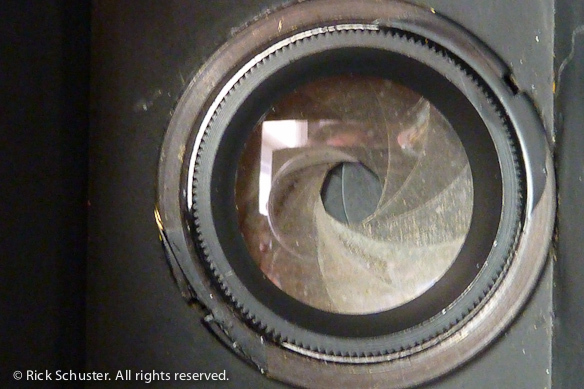 I wonder is it any way we can clean the glass inside the camera. It might be fairly easy to remove the top viewing screen and clean the screen inside, as well as the mirror. Glad to hear some of you are still printing in the darkroom. I’ve gotten lazy — my darkroom has been packed away in boxes for years, and has been replaced by film scans, Adobe Photoshop Lightroom, and inkjet printers. You reference that the camera will take only 620 sized film (although you point out that you can “squeeze” a 120 roll into the camera) You also mention that the earlier versions of this camera (mid-1946 and earlier) has a small knob on the left side below the viewfinder (which is what catches the other end of the film spool) The other difference of the earlier model is that it also takes 120 film as well as the 620 – the later models (post 1946, like yours) will take only 620. 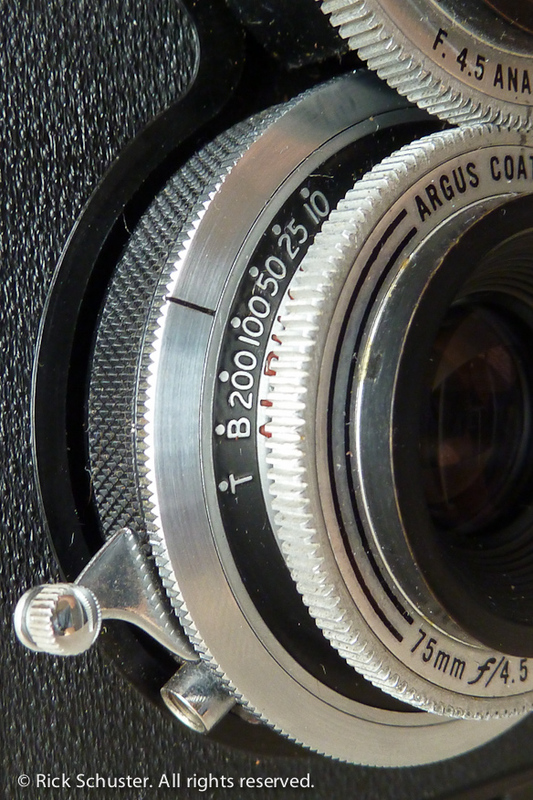 I have one of the earlier models – it was given to my dad by his parents, my grandparents, when he returned from World War 2 and he let me first use it in the mid/late 60s It was my first real camera and I still have it. I work as a professional photographer so you can imagine this camera has a great value to me. Thank you for your review! 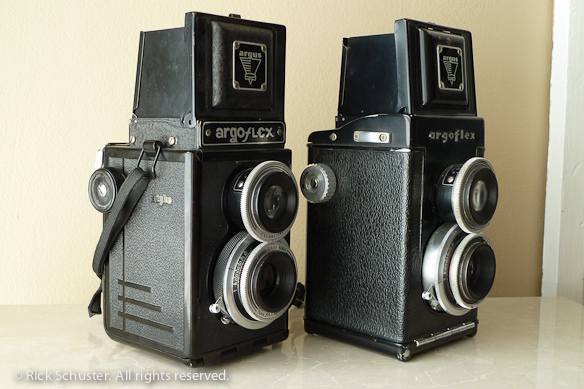 By the way – in addition to digital, I still use film, including printing in the darkroom…although I haven’s shot on the Argoflex in quite a number of years. Thanks for the info, Mark. That’s good to know that the earlier model was built for 120, not 620. I should put another roll through this camera. Great work, by the way. I love your wide landscapes. Do you shoot those on film or digital? Thank you for your comments on my wide landscape (panorama) images – those are shot on film – I use a Fuji 617, one of the early models – later models offer changeable lenses but the one I use has a single fixed lens – 105mm, which is “normal” for this format – the negative is 2 1/4 x 6 3/4 – I have to print with a 5×7 enlarger. The images on the web site are scans of course, to digitize them for things like the web site…once digitized I can make ink-jet prints, which I do, as well as the darkroom silver prints. I think the Fuji 617 would be a great camera. That huge neg must be amazing. I love that you still do darkroom prints as well as scanning. It’s great to see you putting that camera to such good use. It’s approximately 3 inches wide by 3 3/4 inches deep by 5 1/4 inches tall.